As business is expanding, maintaining of accounts is becoming difficult. Accountants are appointed for maintaining accountants but there is a criteria, that all men are prone to do some kind of mistakes. And also manually accounting takes lot of time. Instead of facing this problem, inventory software will help you to solve this problem. We provide outstanding, interactive software, which will help you to run your business successfully. It will take less time, efforts. Virtual Inventory Control Software Tired of Calculating your stock status using manual entries or ready to use inventory softwares. SoftCreekIndia provides the ultimate solution to control your inventory. Our Customized Inventory Software helps you manage your inventories in your way. Managing stock has never been as easy job! Soft Creek India's Inventory Software lets you take full control of your inventory and invoicing. Save time, manage customers and get one step ahead of your competition with this inventory software. Create invoices and manage stock in a snap. Generate Reports on a single click and stores details for companies and products in an organize way. a) Frequent analysis of purchases, sales and inventory records. b) Calculations of the taxes applied by the government for all the materials purchased. c) Adds an unlimited amount of items & categorizes items to differentiate more precisely, create filters for grouping of like items. d) Excellent quality of output for reports, all frequently used reports at the click of a button. e) Password-protection for sensitive data & ability to back up your data for important safekeeping greater speed and efficiency and better record keeping. An �Invoice� is a bill that needs to be paid by the party related to the transaction made. Invoices are of two kinds, "Invoice Received" these are received from the "Vendors" for the items purchased. "Invoice Issued" these are to be issued to the "Customers" for the items sold. Quotation module develops quotes quickly and easily. Users can quickly quote items factoring in such costs as materials, labor, taxes, and overhead/profit markups. This module enables you to keep the record of the order given to the Vendor of the product, which further helps you to verify with the order given. Stock Ledgers are prepared to keep the track of the stock of the materials. The Stock Register module tracks stock and stock transactions of all the materials. Stock Ledger computes the actual cost of goods sold and gives a view of inventory throughout the year, at the class and department level in a variety of categories. The Sales Order Module keeps an optional history of all revisions to each individual Sales Order, as well as a complete history of all Sales Orders on a customer-by-customer basis. Generates customer invoices & tracks opportunities, accounts, and activities. Warehousing facilities are secured and manned by skilled and experienced team members for the best, superior service. Most orders received get processed and shipped the same day for quick, efficient service. This feature enables businesses to create bar codes as part of the larger economic system. It can print the required labels so they can be attached or added on to the desired product. Bits of information are encoded within bar codes and are read by a bar code scanner. Bar-code software is most often used in conjunction with databases and is utilized on everything from shipping forms, labels, ID cards, direct mail pieces, Tape cartridges and invoices to retail items. Bar-code software does not require human input, can be read by automated machines and is virtually error free. 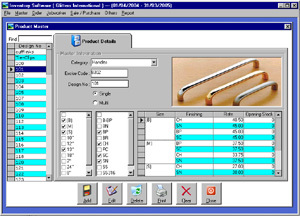 Bar codes provide a quick and error free means for inputting the data into an application running on a computer. Bar codes provide a simple and inexpensive method of encoding text information that is easily read by inexpensive electronic readers. There are many taxes applied, on the purchase materials & on sales against all the purchase materials, like Service tax, Turnover tax, B.S.T, C.S.T, V.A.T, Custom duty, Clearing, Forwarding charges etc. Thereby these taxes applied in each of the product.